Foresight Land Surveying specializes in boundary surveys, mortgage inspection reports, topographic surveys, ALTA/NSPS surveys, elevation certificates, and constructions staking. Okmulgee County, Oklahoma is positioning itself to make significant progress through economic development initiatives and bringing in more businesses and residents. This will have an impact through increased residential and commercial property values, but also increased liabilities. What sets us apart is our years of practical, progressive, and professional experience as well our dedication to providing services to our clients on time, under budget, and of the highest quality. We strive to build lasting professional relationships with our clients through superior customer service. Foresight Land Surveying uses a proprietary process for planning, tracking, and managing even the biggest projects. Our proven method allows us to deliver what our clients demand. We believe that professional service, high-quality deliverables, and client satisfaction should be the ultimate results of every survey we do. Foresight Land Surveying strives to provide the highest quality services for our clients. Our expertise can make the difference between a successful project and a costly one. Whether you need a Mortgage Inspection Report or an ALTA/NSPS survey or something in between, discover the difference Foresight can make. Manda was born and raised in Henryetta, OK. She earned an Associate of Science degree from OSU-IT in 2012. Her responsibilities as office manager include being the first point of contact for our clients, receiving job orders and building job folders to ensure accurate execution in the field. She is also the support between the client, field surveyor and drafting team, as well as performs normal office duties. 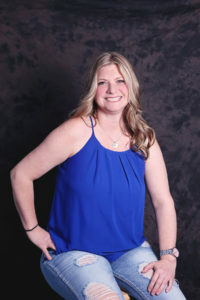 Manda is a full time mom, holds and utilizes professional licenses in both real estate and property/casualty insurance and is an active community volunteer. In addition, she has also held office on the Board of Okmulgee County American Farmers & Ranchers for four years. Manda beganis happy to be a part of the team at Foresight Land Surveying and believes you can’t find better people to work for and with. Born and raised in Carlisle, Pennsylvania and the surrounding area, Ron joined the Foresight Land Surveying team in February 2017 following a 20-year career in the United States Marine Corps. 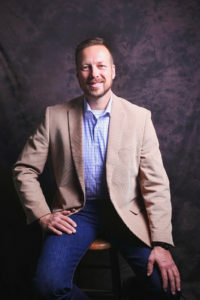 During his career as a Marine, Ron specialized in the tactical employment of Unmanned Aircraft Systems (UAS) and gained essential leadership skills through experience and world travel. With a newfound interest in the land surveying profession, Ron is embarking on a new career with the same dedication and devotion he displayed as a Marine. 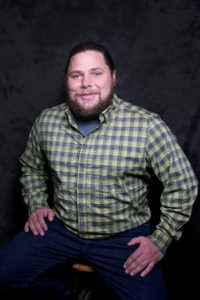 Being certified by the FAA as a Remote Pilot – Small Unmanned Aircraft Systems, he is enthusiastic and eager to translate and apply the skills he has acquired to his new profession, including assisting in Foresight’s induction and development of UAS in land surveying. Luke is from Morris, OK. He currently resides in Okmulgee where he is obtaining his degree at OSU-IT. He has been with Foresight Land Surveying since July, 2018 and looks forward to continuing his land surveying career after graduation. Luke is devoted to his family and enjoys spending his free time with them, gaming and attending music festivals. Jackie grew up on their family farm in southwestern Pennsylvania. After finding her passion for drafting in high school, she continued her education at Pittsburgh Technical College and received her degree in drafting. She has dedicated herself to the surveying field for the past ten years and continues to grow with the industry. 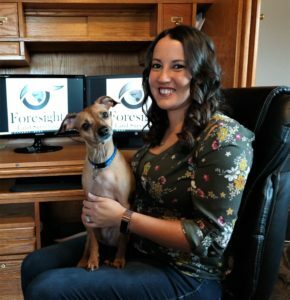 Jackie joined the Foresight team in August of 2017 and is grateful to be part of such an amazing and devoted team. 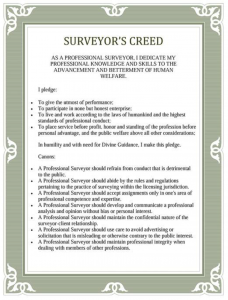 WHY SHOULD I HIRE A SURVEYOR? Owning land is a big part of what we imagine when we think of “The American Dream”. For most of us, purchasing real estate is the single largest investment we’ll make in our lifetime. Buyers do their due diligence and ensure their new house is safe and sound, but often have no idea where their property lines actually are. In one instance, the property a client thought he purchased was completely different than what was described on his deed. (Imagine his surprise when we discovered he had put a beautiful house on someone else’s land!) It was a costly mistake that could have been easily avoided by consulting with a Professional Land Surveyor prior to purchasing the land. A boundary survey will identify encroachments that may not appear on disclosure statements at closing- whether the seller knows about them or not. Resist the urge to view a land survey as an unnecessary and avoidable closing expense. If there’s an issue with your new land purchase, it’s always better to find out ahead of time. Also, with a boundary survey plat in your possession, you will have an official record and may be able to use it to defend your property rights should an issue come up with adjacent landowners. If you’re considering purchasing a property, contact your agent or closing officer and tell them you want a boundary survey. – How do I read my legal description? – How do I know if there are any encroachments on my land? – What is an easement and how does it affect me? – Is my house in a floodplain? – Isn’t a mortgage inspection the same as a boundary survey? – Can I be held liable for what happens on land I didn’t realize I owned? Foresight Land Surveying can help make sense of the issues regarding your land’s boundaries. If you wait until there’s a problem before you call a surveyor, it may already be too late. We strongly recommend a land boundary survey BEFORE you purchase any real estate, but we’re happy to offer our services any time. If you don’t know exactly where your boundary lines and property corners are, call Foresight Land Surveying. There are many reasons for ordering a survey and many types of surveys. Some of our services have very specific purposes. It can be confusing, but we’re here to help make sense of it all. Use the drop-down menus under the “Services Offered” tab at the top of this page to explore some of our services. If you’re still not sure or what you’re looking for isn’t listed, call us or send us an email. We’re glad to help. In fact, that’s our purpose.